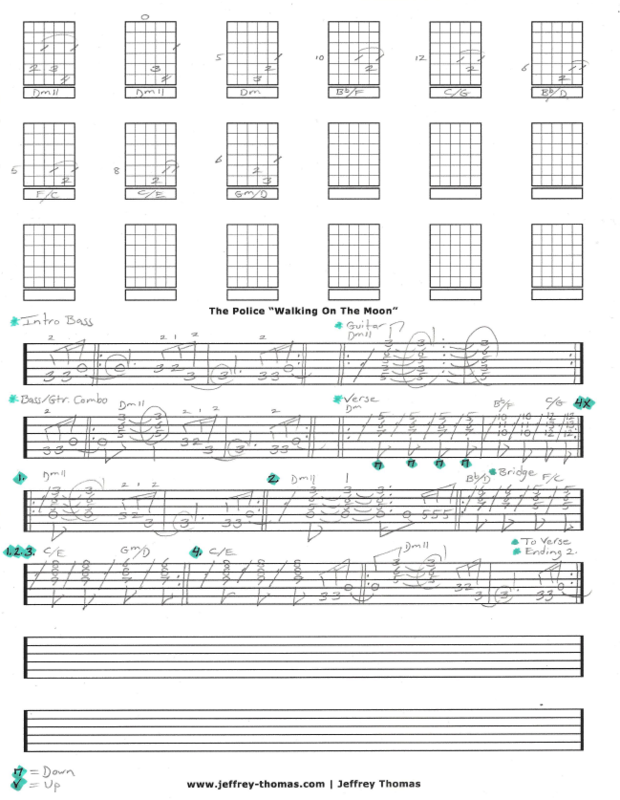 The Police Walking On The Moon Free Guitar Tab by Jeffrey Thomas. This free guitar tab will show a custom version of this classic Police tune. Since the bass line is so recognizable I started with it then moved into the proper chords and chord/bass combo for the intro. This will sound great especially if you are playing solo without a bassist. The verse uses triads with a reggae groove just like the recording. This tune is very popular with my guitar students. If you would like the guitar tab for free just send in your email address using the form provided. Need help playing this song? Fill out the Schedule A Free Lesson form to set up your free Skype guitar lesson today! “Walking On The Moon” was written by Sting drunk in his hotel room after a concert in Munich. The original words were “Walking round the room”. Make sure to check out more free online guitar tabs on my tab, video and blog pages.